Run with Noah: Regardless of What Happened, I will Run the Boston Marathon! Regardless of What Happened, I will Run the Boston Marathon! Earlier today, I friend who has been struggling with his weight called me to let me know he signed up for the Boston Marathon, and I was the first person he called to say that I inspired him to sign up. I was flattered and so happy to hear that news that I was looking forward to my meeting. As I was in a middle of helping launch a new company, we took a break and I checked my email and noticed a bunch of people tagging me on Facebook. A confusion set in and my colleague announced a bombing at the Boston Marathon! First I quickly checked FB to make sure that no one I knew running this year were ok and they were, and I took a moment to say a prayer. A bunch of emotions bounced in my Tour, as the Boston Marathon was the race that I was going to cap my 50 State Marathon Run, thinking about what if that happened when I ran any marathon, to the passing of young boy who is Elijah's age, to all the families and friends who came out to cheer triumph and victory only to feel fear and worry. More importantly, all the people who committed, sacrificed, and worked so hard to prepare for this legendary race, only to be part of this horror and tragedy. My concern is to all the people who dream of doing a marathon, to all the people who have changed their lives because of a marathon, to all the people who have inspired others to be healthier, and to all the people who have raised millions of dollars to help different caused from childhood obesity to cancer will cause a negative shift for this positive uplifting event. Today is my second to last day of my Cleanse, and for the past 20 days I have eaten clean and not cheated once. As I walked into my home, I thought, why not eat whatever I can find, including the ice cream in the back of my freezer. I was thinking it was ok since what had occurred and I feeling sad about what could have happened especially if it was my turn to run Boston this year. Instead of binge eating, I went to my bed to lay down, and take a moment to think. That moment, I dedicated myself to choose, and I chose to take control. While I could not control what happened, and I wasn't about to let my emotion control me. 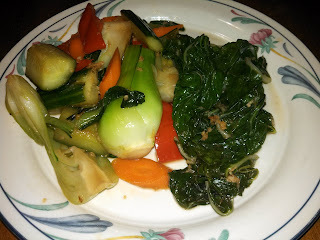 I will control my circle of influence and made Asian Stir Fry and Braised Swiss Chard. I said a little prayer being thankful for my family, a little love to those families affected, the opportunities that have been given to me, and to the opportunities that will be provided to me. There have been many times that I have given up when I felt bad. This time I will not let my emotions get the best of me! Good Food for a Good Life! So that I may bring more Awesomeness to more people! When I first started to learn about running, I said, "I am going to run Boston." Then I hurt my back in October, I asked, "Am I going to be able to run Boston." When I had my seizure, I asked, "Am I going to be able to run Boston." And today, I ask again, "Am I going to be able to run Boston, and my answer is YES!!!!!" I plan on running/walking my next marathon, which most likely will be the Baltimore Marathon in October 2013, and I invite you all to join me. Run for something more that who you are! And my heart is in Boston today. Kiss your loved ones tonight!